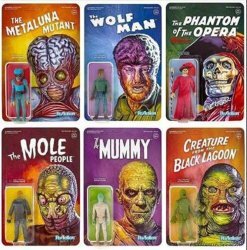 Super 7 is proud to present its Universal Monsters 3.75" ReAction figures assortment! Six iconic monsters from the Golden Age of Classic Horror! Creature from the Black Lagoon - From the 1954 classic horror film Creature from the Black Lagoon! The cardback features new and original art by the legendary Ed Repka. The Phantom of the Opera - The Masque of the Red Death from the 1925 classic horror film The Phantom of the Opera! The cardback features new and original art by the legendary Ed Repka. Metaluna Mutant - The Metaluna Mutant from the 1955 science fiction film This Island Earth! The cardback features new and original art by the legendary Ed Repka. Mole Man - From the 1956 science fiction film The Mole People! The cardback features new and original art by the legendary Ed Repka. The Mummy - From the 1932 classic horror film The Mummy! The cardback features new and original art by the legendary Ed Repka. The Wolf Man - From the 1941 horror film The Wolf Man! The cardback features new and original art by the legendary Ed Repka. Each figure is packaged individually on a blister card as shown. These figures are adult collectibles and not considered toys. Manufacturer recommended age: 14 years and up. 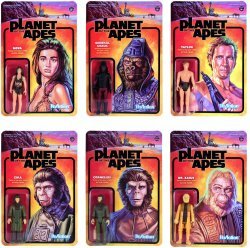 Super 7 ReAction Planet of the Apes Action Figures Set of 6 - JUST IN!